Current estimates value the global market for injectable drugs at $240 billion, giving injectables a 28% share of the overall drug market worldwide. This annual Drug Development & Delivery report on hand-held devices reveals that the injectables sector is witnessing some very specific trends that are affecting the market’s growth. For example, biologics are being attributed as the main driver for this growth because these are larger molecules that need to be administered by injection given their size and profile. The biologic drug market is expected to grow to $251 billion by 2018 and $900 billion by 2024.1 For these larger and more viscous biologic products, wearable injectors could prove invaluable. Single-use wearable or bolus injectors deliver precise amounts of drug in doses as high as 30mL. With approximately 250 molecules identified by Roots Analysis requiring wearable injectors, the bolus market is projected to generate $8 billion in device sales by 2024. Another trend is a move toward more customized hand-held devices that take advantage of platforms that have already been developed. Customizing these platforms differentiates them from the competition and enables pharma/biopharm companies to reach the clinic and, ultimately, the market faster. Finally, manufacturers are developing hand-held devices with the user in mind. This Human Factor Engineering provides detailed understanding of how the devices will be used, identifies safety risks, and is expected to help ensure patient compliance. This year’s report explores the products from a variety of device developers that are incorporating one or several of these above mentioned offerings into their devices. It is generally accepted that Human Factor Engineering is an integral part of developing any new drug delivery device. Human Factor studies address many different “human elements,” such as perceptual, cognitive, ergonomic, emotional, social, and even cultural. The outcome of Human Factor studies should provide a clear understanding of how to avoid errors, identify safety risks, improve patient education/training and competence, and eventually patient compliance. In addition, clear regulatory guidance has emerged from various government authorities, including the U.S., Europe, and others, over the last few years. This guidance outlines how to integrate Human Factor studies into drug delivery devices during their development in order to optimize their design and gain successful regulatory approval. Aptar Pharma applied Human Factor guidelines to the Pro-Ject® development cycle. Aptar Pharma’s Pro-Ject is a novel auto-injector that has been designed and developed with input from patients and healthcare professionals to ensure patient convenience and compliance. During the initial Pro-Ject concept phase, Aptar Pharma carried out several investigations and market studies with patients and healthcare professionals. The main objective of these studies was to better understand users’ and healthcare professionals’ experiences, expectations, and preferences for auto-injectors. Once a prototype of Pro-Ject was developed, additional user acceptance studies and investigations were performed to deepen the understanding of how rheumatoid arthritis patients interacted with Pro-Ject. Results demonstrated that both training nurses and rheumatoid arthritis patients confirmed the benefits of Pro-Ject in terms of ease of use, ergonomics, and design. Features include push-on-skin activation, slow injection, hidden needle, highly visible indicator window, and audible feedback. “Patient-centric development of drug delivery devices is now the accepted norm. Applying Human Factor principles means that the outcomes should benefit all the stakeholders involved,” says Dr. Gerallt Williams, Director Scientific Affairs, Aptar Pharma Prescription Division. “Aligning Pro-Ject with patient needs during its development is a major step forward in delivering this benefit. FDA’s recent acceptance of Novartis’ application for a biosimilar version of Amgen’s Neupogen marks a new stage in the race to the U.S. biosimilar market. This race, fueled by the $50-plus billion worth of biologics coming off patent by the end of this decade, as well as the cost pressures and market reaction from the Affordable Care Act, will create an opportunity for hand-held delivery devices. Biosimilar developers aim to be as “biosimilar as possible” to the FDA-licensed biologic while still offering meaningful market differentiation from the innovator product. In this effort, biosimilar manufacturers have an opportunity that is not as readily available to generics manufacturers: they can differentiate on something other than price. 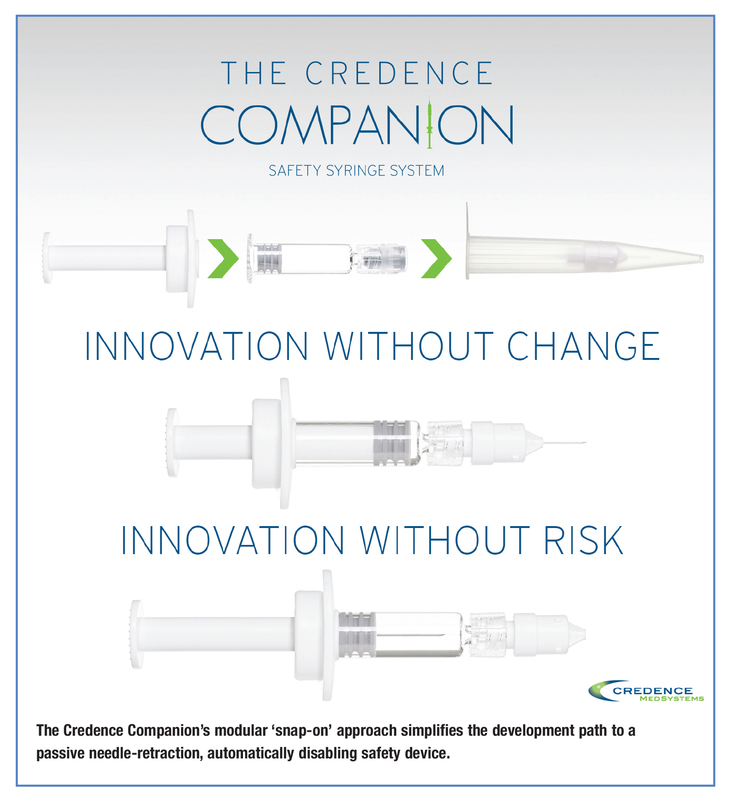 The ace-in-the-hole is the hand-held delivery system, explains John A. Merhige, Chief Commercial Officer, Credence MedSystems Inc.
Credence MedSystems will launch the Companion Safety Syringe System later this year. Initial meetings with a select group of biopharm manufacturer partners indicate that the value the Companion brings lies not only in the end-user benefits of the final device, but also in the simplified path for biopharm partners to bring their drug to market in the Companion System. For the end-user, the Companion System is a best-in-class safety device with passive needle-stick prevention features, explains Mr. Merhige. At the completion of the injection, the needle automatically retracts into the syringe barrel and the syringe is automatically disabled. The Companion allows the choice of any size needle, offering passive safety, even with needles two inches or longer, which Mr. Merhige says is unique in the market. Also unique is its role in lyophilization applications where conventional safety devices tend to fail due to premature activation of the safety features during aspiration or reconstitution. The Companion, prefilled with a diluent, allows delivery into the vial for reconstitution followed by drawing up of the drug solution into the syringe, all while maintaining the passive safety intact for the injection into the patient. This, says Mr. Merhige, is critical given the wide array of biologics that require a lyophilized presentation to achieve appropriate shelf life. “Whether for the growing number of inexperienced home injectors who need needlestick safety and prefer the naked prefilled syringe to the auto-injector, or for the traditional caregiver dealing with time pressures, the Companion provides safety and flexibility in drug delivery,” he says. Of further importance to drug manufacturers is the modular approach of the Companion Syringe System. Biopharm manufacturers have complete freedom to choose and source the critical syringe, plunger/stopper, and tip cap primary package components from any vendor(s) they choose. The Companion plunger rod, Flex Finger Flange, and Guide-On Needle components accompany and snap on to the prefilled syringe. The primary drug container is undisturbed and there is no contact between the Companion components and the drug product before use. This approach dramatically impacts the development and regulatory requirements, as well as the sourcing risk profile, for the biopharm partner, he says. He adds that Credence has approached this issue by developing the Guide-On Needle Cover. The cover is designed to allow easy attachment by dexterity-challenged users; fingertips are not needed but rather the needle can be attached by holding the cover in a fist or in a thumb/forefinger wedge. Further, the user receives audible, tactile, and visual feedback of a successful needle-to-syringe connection. Finally, the cover cannot be removed until the needle has been mounted successfully with a pre-determined torque level, ensuring that the aforementioned failures will not occur. In order to design the optimal device for an application, it is important as a design firm to not only fully understand the client’s requirements and expectations but also understand the overall scope of the project and application, i.e. the operational context, the end user, the geographical setting, etc. Duoject has successfully transitioned into manufacturing by completing the validation phases of production for two of its reconstitution devices: the E-Z-Link and PenPrep EVO. The cartridge-based PenPrep EVO reconstitution device will be part of a major pharma company’s combination product and will be entering into production in the fall for market launch in early 2015. The E-Z-Link, currently used in clinical trials, received regulatory approvals this past year in the form of a 510k and CE Mark and is now available for commercialization. 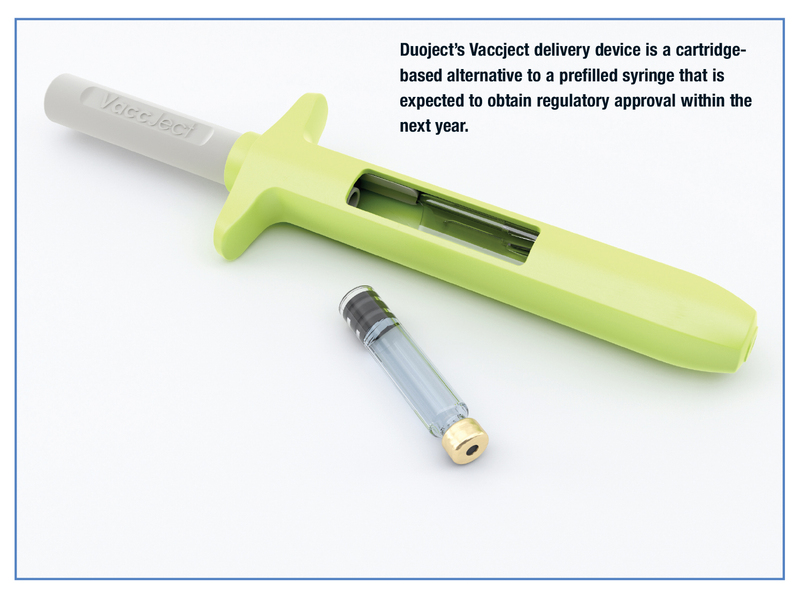 Duoject’s Vaccject delivery device is a cartridge-based alternative to a prefilled syringe, including a built-in auto-retract needle safety feature. One advantage of this device is that the compact 1mL cartridge drug container can be kept separate from the device until moment of use, greatly improving cold-chain storage, says Mr. MacDonald. Its integrated safety feature ensures that the injection needle is never exposed to the user, either before, during or after injection. It is intended for vaccines as well as any other drug that requires safe injection. Vaccject has undergone a range of testing and user studies these past years with the goal of obtaining regulatory approval within the next year. Duoject has partnered with a major contract filler to offer cartridge filling services to pharma companies interested in its Vaccject device. During this past year, Duoject concentrated its efforts in obtaining regulatory approvals for its reconstitution devices as well as its ISO 13485 certification. The company also entered into development of a novel handheld injection device for a client, details of which are still confidential at this time, but should be available to the public within the next year, says Mr. MacDonald. Enable Injections is a start-up company that has developed a disposable body-worn bolus injector to deliver high-viscosity/volume payloads up to 20cc to the subcutaneous tissue. The company has completed its 16th Human Factors study and continues to conduct HF studies in parallel with design work. “Our findings are that our Enable Injector is strongly preferred by users over the conventional cartridge-based products. 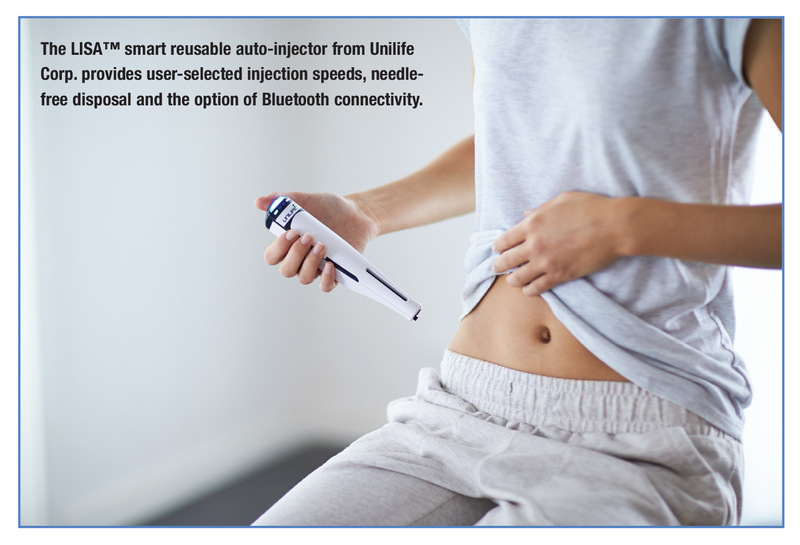 The key advantages of our device vs. cartridge-based products, as expressed by the users are numerous,” says Michael D. Hooven, President and CEO, Enable Injections. First, he explains the Enable injector is significantly smaller, lighter, lower profile, and more discreet than cartridge-based products. The long-term container closure is not contained within the device, allowing an optimum size, weight, and profile. And, the 20mL device is smaller than competitive 5mL devices. Second, a “pause” function has been incorporated that allows the user to pause the injection if they are experiencing any pain or discomfort. The user holds the button down until they are comfortable. Once the button is released, the injection is continued with no further discomfort. He adds that patient pain is increased with colder drug; refrigerated drug viscosity can increase more than threefold; and battery power is significantly reduced in a refrigerated device. From a pharma/biotech perspective, Mr. Hooven says that the Enable Injector offers several advantages. For example, by utilizing absolutely standard container closure–vial, cartridge, or prefilled syringe – there is no change to manufacturing filling lines or processes; no need for long-term stability testing of a new container closure; no need for an aseptic manufacturing facility to combine the container closure with the device; and the container can be combined with the device at the optimum point in the supply chain. In addition, the injector offers highvolume dosage: 1-10mL for the standard product and up to 20mL for high-volume product. A change in volume does not require any change to the device. “This is especially important in clinical studies where dosing volume has not yet been determined,” he points out. Enable expects to conclude limited clinical studies later this year. There has been a significant increase in the number of biopharma companies that will need self-injection devices. Auto injectors, in particular, have been in high demand. Existing customers of SHL are working on a broader range of projects, planning for both near-term and future needs. This is the right approach as device programs will still take a fair amount of time to implement, regardless of utilizing platform technologies or even pre-configured devices. In addition, several biotech and pharma companies are requiring a far greater number of devices for their portfolios while several new biopharma companies that have never had devices in their product line before are getting involved in this area for the first time. The learning curve will be steep for these new companies. “As a result, device companies now need to be prepared to allocate the resources required to address this change in the market, providing a more extensive array of devices and additional services to support these customers’ needs,” says Steven R. Kaufman, Vice President of Global Marketing, SHL. 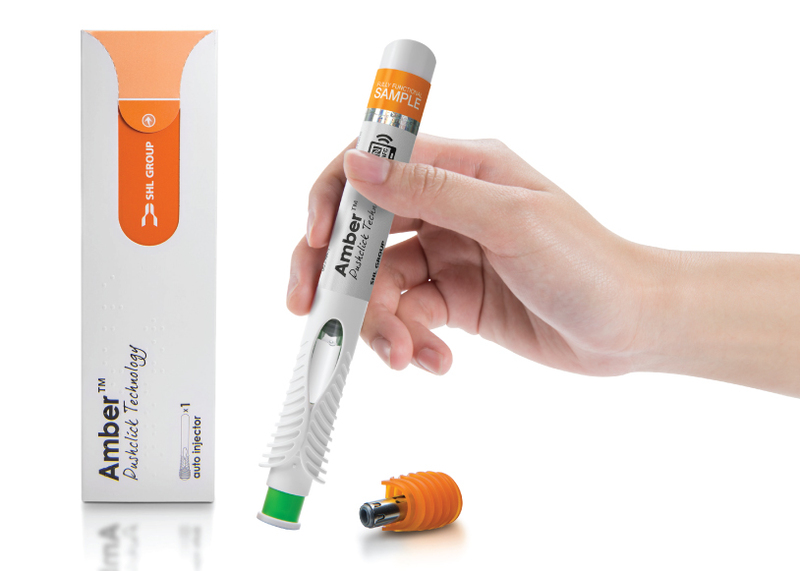 One of the newest devices introduced by SHL in this past year is the Amber Auto Injector. This device features Pushclick™ technology that enables it to be activated by simply pushing against the injection site, a total of only 2 simple steps. The ergonomic industrial design of the device provides various grip options when removing the cap and when performing the injection. “In the next 12 months, the company will be announcing several new technologies, such as the integration of ‘smart tech’ with its devices, including near-field communication (NFC) labels that interact with patients while they are using our customer’s auto injectors,” says Mr. Kaufman. SHL has several devices currently in development. In particular, the company is looking at devices that can handle higher injection volumes and greater viscosities. Many of these new next-generation devices will be commercialized within the next 5 years. He adds that many trends are converging to spark a shift in how handheld devices are leveraged by pharmaceutical companies to enhance and differentiate their injectable therapies. The specific needs of biologics have increased demand for platform-based devices that can be customized to address specific molecule, commercial, and patient requirements. With many of these therapies being targeted for patient self-injection, devices must be as safe, simple, and convenient to use by the target population as possible. “Pharmaceutical companies recognize they can use these device benefits to drive preference amongst patients, prescribers, and payors to build market share against the competition,” says Mr. Allan. 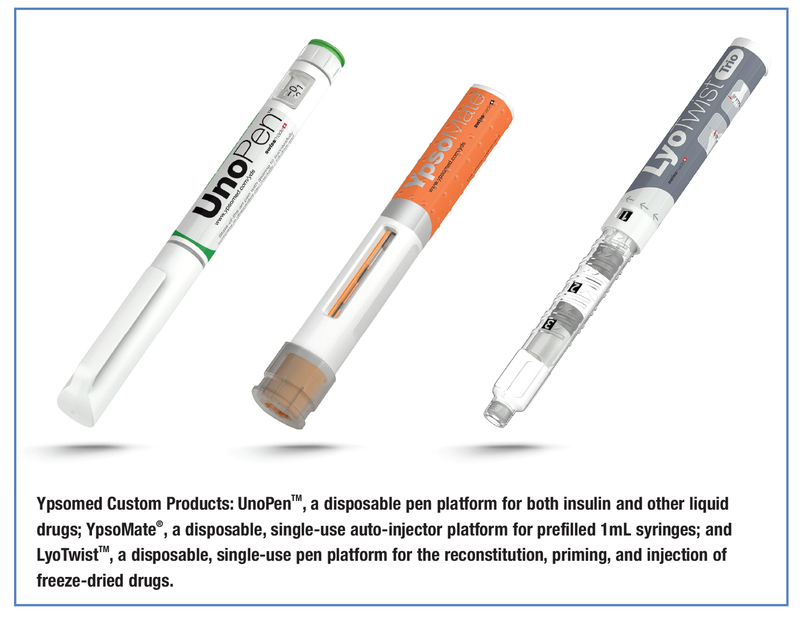 Unilife is experiencing accelerating customer demand for all of its product platforms, which offer various features that can accommodate the needs of virtually all injectable therapies outside of insulin. For example, the company is rapidly expanding the manufacturing capacity for its broad platform of Unifill prefilled syringes. Its wearable injectors are generating significant demand for use with large-dose volume biologics unsuited for use with hand-held devices, says Mr. Allan. The wearable injectors, which are prefilled, pre-assembled, and ready-to-inject, represent a solution for customers with portfolios of drugs best suited to the subcutaneous self-injection of doses between 2mL and 15mL. And LISA, a smart, reusable autoinjector is being pursued for its benefits over conventional disposable systems. LISA represents a solution for patient self-injection of therapies requiring regular injections. “LISA overcomes many of the issues patients face using conventional, disposable auto-injectors, provides needle-free disposal, and is highly customizable with a variety of options, including Bluetooth connectivity,” he says. It features true end-of-dose indicators that allow users to select the speed of injection to minimize pain or discomfort while its reusability with Unifill syringes improves portability and the convenience of disposal. For drugs that cannot be made liquid-stable, Unilife developed the EZMix platform of drug reconstitution delivery systems, which enable automatic reconstitution that is ventless and orientation-free. This platform brings the process for reconstitution down from around 12 steps to one, opening the door for easy patient self-injection, says Mr. Allan. He explains how one customer required a hand-held device for the injection of lyophilized therapy in a complex and challenging environment. Users were experiencing significant errors during reconstitution with conventional systems. Multiple components were required and there were concerns of needle-stick injury from a high-risk patient population. The ascendency of the global injectable market is one of the most significant trends in the drug manufacturing industry today. According to an October 2013 Datamonitor forecast, the injectable market as a whole, which includes hand-held devices, is quickly becoming the single largest driver of the pharma/biotech market. However the injectable market is a dynamic and continuously changing industry with ever-growing cost pressures, intensifying competition, and increasing regulatory demands, says Peter Soelkner, Managing Director, Vetter Pharma International GmbH. And, because product variety will continue to increase, the need for special requirements provided by novel fill and final packaging solutions will be paramount. To stay competitive, product differentiation is critical and demands high priority. The growth of biotechnologically drugs has created new challenges for the pharmaceutical manufacturer. Such drugs are often very delicate and tend to be unstable, which has a negative impact on their shelf life. One solution is freeze-drying. Vetter’s dual-chamber technology provides the basis for the patented Vetter Lyo-Ject® syringe and dual-chamber V-LK® cartridge. The dual-chamber design allows the differing ingredients and solvents to be prefilled and stored separately, then easily mixed and administered as needed just prior to administration. These all-in-one solutions also mitigate the residual risk of needle stick injuries allowing non-professionals like patients and family members to safely use the device, says Mr. Soelkner. Market uptake of biotechnology drug products is growing rapidly worldwide. Many of these products are intended for chronic conditions and represent breakthroughs in treatment and outcomes. Self-administration, assisted by delivery systems, offers patients a safe and cost-effective means to help improve adherence to treatment regimens. Some of the newer products require dosing above 1mL, which has been the limit of commercial auto-injectors designed for use with 1mL glass prefilled syringes. Also, several new drug products require higher concentrations to achieve therapeutic dosing, which results in more viscous solutions that may be difficult to inject. 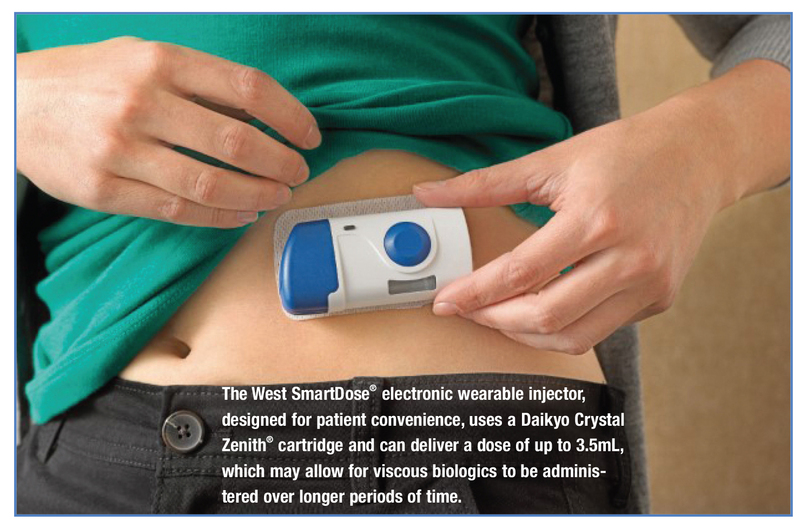 “A new kind of electronic wearable injector for subcutaneous bolus delivery is required to meet the demands of this high-volume and high-viscosity biologic products,” states Zach Marks, Director, Strategic Marketing, West Pharmaceutical Services, Inc. He says that the SmartDose® electronic wearable injector is the first and only electronic wearable bolus injector to have completed a first-in-human clinical study. The single-use, disposable system is currently cGMP manufactured in clinical trial quantities with ongoing investment in scale-up and dual-site manufacturing to meet the commercial needs of the market. Utilizing a Daikyo Crystal Zenith® polymer cartridge along with Flurotec® barrier film-coated elastomers as the primary container, the SmartDose injector is also the only silicone-oil free system, ideal for sensitive biologics, claims Mr. Marks. The Daikyo Crystal Zenith cartridges and closures are available ready-to-fill in industry-standard filling tubs and nests. The target therapeutic areas can include autoimmune diseases such as rheumatoid arthritis, psoriasis, and Crohn’s, as well as hyperlipidimea and oncology. In the future, as more long-acting products are approved, the market may expand with therapies for other chronic conditions requiring self-administration such as diabetes, multiple sclerosis, and hemophilia. West seeks partners for its SmartDose injector technology platform. This platform is intended to be used as an integrated system with drug filling and final assembly completed by the pharmaceutical/biotechnology company. SmartDose® is a registered trademark of Medimop Medical Projects, Ltd., a subsidiary of West Pharmaceutical Services, Inc. Daikyo Crystal Zenith® and Flurotec® are registered trademarks of Daikyo Seiko, Ltd. Daikyo Crystal Zenith® and Flurotec® technologies are licenses from Daikyo Seiko, Ltd.
More customers want to customize an existing product platform for their specific drug. By choosing from an existing platform, a pharma customer wins critical time to clinic and market launch, as the major development phases have already been completed by the device company. Therefore, the platform product only needs to be adapted to the primary container, its filling volume, and the dosing requirement. Customer-specific designs may also be implemented and verified during the customization of the platform within certain limits and manufactured using the same device assembly equipment. “Platforms are ideal for many pharma customers to enter the field of self-injection devices as they do not have the resources or the experience to initiate a device development program from scratch. Platform products are built on a solid patent base,” says Tobias Nemeth, Business Development Manager, Ypsomed. Ypsomed offers several platforms, such as the UnoPen™, a disposable pen platform for both insulin and other liquid drugs, and the YpsoMate®, a disposable, single-use auto-injector platform for prefilled 1mL syringes made of glass or plastic. The UnoPen is suited to insulin suppliers that are competing with the major suppliers in established markets, but it is also suitable for administering GLP-1 drugs as well as parathyroid (PTH), growth (hGH), and fertility hormones (FSH). “The user-friendly and yet economically priced disposable pen is very well accepted by users and is an important marketing tool that allows pharmaceutical customers to clearly set themselves apart from their competitors,” he says. The YpsoMate auto-injector is compact and ergonomic to handle. The needle is invisible to the patient at all times and shielded after use, enhancing safety and compliance. The clearly audible start and end click, and the large viewing window, through which the drug can be seen, increase patient confidence and provide confirmation that the full dose has been injected. The YpsoMate enables the drug to be injected comfortable and automatically as soon as the auto-injector is pressed against the skin. Customer-specific versions of the UnoPen and YpsoMate are in the final stages of customization. UnoPen has gone through formative handling studies for a range of patient groups and the results of one study were recently published. The study took advantage of a broad user population, including different user characteristics across a range of indications. The product was recently launched as Tanzeum™ in the U.S. and will be launched in Europe under the trade name Eperzan®. 1. Bolus Injectors Market, 2014 – 2024, Oct 25, 2013, http://www.rootsanalysis.com/reports/view_document/bolus-injectors-market-2014-2024/35.html, accessed on Aug. 6, 2014.